Card Text: 2-IMG00015 The brilliant Malinke leader Samory Touré (c. 1830-1900) founded the Wassoulou Empire, an Islamic state in West Africa, in 1878. By 1881, Wassoulou extended through Guinea and Mali, from what is now Sierra Leone to northern Côte d'Ivoire. When the French occupied Senegal in 1888 they collided with this resourceful Muslim soldier. Samory successfully resisted French rule in West Africa from 1882 until his capture in 1898; after almost a decade of struggle the French caught him and exiled him to the Congo, where he died. The French then took over upper Guinea and its gold mines. Citation: René Dazy photo. In "Africa Aeterna: The Pictorial Chronicle of a Continent," text by Paul Marc Henry, trans. by Joel Carmichael, conceived and produced by Georges and Rosamond Bernier, (Lausanne, Switzerland: Sedo SA, 1965) p. 188. Card Text: 2-IMG00202 "English Methods of Colonizing Africa," a German view of the British Empire, 19th c. A British imperialist pours alcohol into the mouth of an African, an Anglican priest drugs him with religion, and a soldier squeezes gold (profits) out of him. 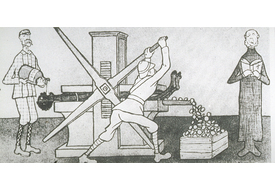 German, Belgian and French methods were similar. Citation: Thomas Theodor Heine cartoon, "So kolonisiert der Engländer," Simplicissimus, Special Colonial Number, Munich, GERMANY, 1904; and Oct. 22, 1906. BBC Hulton Picture Library, Unique House, 21-31 Woodfield Rd, London W9 2BA UNITED KINGDOM. Copy in Jan Nederveen Pieterse, "White on Black: Images of Africa and Blacks in Western Popular Culture," (Yale University Press, PO Box 209040, New Haven, CT 06520-9040) 1992. Copyright Jan Nederveen Pieterse, Royal Tropical Institute, Mauritskade 63, 1092 AD Amsterdam, THE NETHERLANDS; and Stichting Cosmic Illusion Productions Foundation, NOVIB, Den Haag, THE NETHERLANDS, 1990. All rights reserved. Card Text: 3-IMG00046 An early Christian effort to establish racial harmony in South Africa. 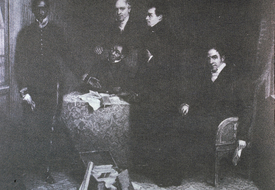 "Dr. John Philip led this delegation of missionaries and Christian Africans to a London Parliament Select Committee on Aborigines in 1835-36. Philip campaigned tirelessly for the integration of Africans into the white economy and social system in south Africa, claiming this was the only way to guarantee racial peace there." "Philip was a Scottish missionary and minister in the Cape Colony. He believed that Africans should be converted to Christianity and persuaded to live according to European norms. Yet he stood up for the human rights of Africans under British rule, making him unpopular with the colonial powers. In 1835 Philip traveled to Britain with colleagues and two African converts of the Khoi-Khoi and Xhosa indigenous South African peoples. The evidence this group presented to the House of Commons led the British government to return Xhosa territory taken from them by Britain." Citation: Museum Africa, 121 Bree St, Newtown, Johannesburg, Gauteng 2001, SOUTH AFRICA. Copy at Hulton Archive, Getty Images, 601 N 34th St, Seattle, WA 98103. Text and photo in "Reader's Digest Illustrated History of South Africa, The Real Story," (Copyright Reader's Digest, 480 Bedford Rd, Pleasantville, NY 10570-2929. Reader's Digest Association of South Africa [Pty] Ltd, 1988) p. 153. All rights reserved. Second text: The Museum of London, 150 London Wall, London EC2Y 5HN UNITED KINGDOM. Card Text: 2-IMG00190 Cecil Rhodes: Cape to Cairo. An English businessman and imperialist in South Africa, Rhodes founded the De Beers diamond company, eventually controlling 90% of the world's diamond production. An ardent believer in British colonialism, he founded the nation of Rhodesia (now Zimbabwe), and was instrumental in assuring British dominance of southern Africa. After becoming prime minister of the Cape Colony in 1890, he used his influence to strengthen British control over southern Africa. His master plan was to establish a Cape-to-Cairo railroad line linking British colonial interests in Africa between Egypt and the Cape. The Boers resisted. After authorizing an unsuccessful invasion of the Boer Republic of Transvaal, Rhodes was removed from office by the British government, but the seeds of the Anglo-Boer War (1899-1902) had been sown. The war began when Britain decided to annex the Boer republics. The fighting was vicious, with the Boers using guerrilla tactics and the British eventually having to use 450,000 troops to achieve victory. In 1910 the British colonies in southern Africa unified as the Union of South Africa, becoming the Republic of South Africa after World War II. 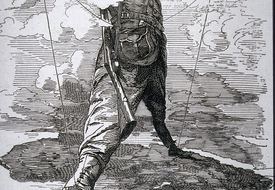 This 1892 depiction of Rhodes, diamond magnate and promoter of empire, as "The Rhodes Colossus, Striding from Cape Town to Cairo," became an archetypal image of British imperial power in Africa. In 1887 Rhodes told the House of Assembly in Cape Town that "the native is to be treated as a child and denied the franchise. We must adopt a system of despotism in our relations with the barbarians of South Africa." This attitude helps to explain the rise of white supremacy and the decline of his popularity in modern Africa. Citation: Edward Linley Sambourne cartoon, Punch (London, Dec. 10, 1892). Text: Thomas Caswell, Copyright © 1999-2003 Oswego City School District Regents Exam Prep Center, 120 E 1st St, Oswego, New York, NY 13126. All rights reserved. Our thanks to Mr. Caswell for this concise history. 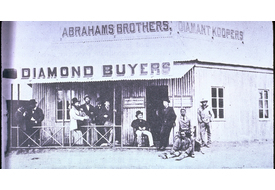 Card Text: 2-IMG00280 Abrahams Brothers, "diamond buyers," Dutoitspan, South Africa, 1872. The 1867 discovery of diamonds in the Cape Colony, now a province of South Africa, radically changed the world's supply of diamonds and its conception of them. As annual world diamond production increased more than ten-fold in the following ten years, a once extremely rare material became more common and accessible to western society with its growing wealth. Science learned that diamonds came from volcanoes, and everyone learned of Cecil John Rhodes, Barney Barnato, Kimberley, and De Beers. Today South Africa maintains its position as a major diamond producer. The story of diamonds in South Africa began in 1866 when 15-year-old Erasmus Jacobs found a transparent stone on his father's farm on the south bank of the Orange River. Over the next 15 years, South Africa yielded more diamonds than India had in over 2,000 years. This great outpouring of diamonds coincided with the depletion of Brazilian deposits and with a great rise in wealth, particularly in the United States, that ensured diamond prices did not fall as they had when Brazil outproduced diamond demand in the 1730s. The first diamond discoveries in South Africa were alluvial. By 1869, diamonds were found far from any stream or river, first in yellow earth, and below in hard rock called blueground, later called kimberlite, after the mining town of Kimberley. In the 1870s and 1880s Kimberley, encompassing the mines that produced 95% of the world's diamonds, was home to great wealth and fierce rivalries, most notably that of Rhodes and Barnato, English immigrants who consolidated early 31-foot-square prospects (claims) into ever larger holdings and then mining companies. In 1888, Rhodes bought out Barnato and merged both holdings into De Beers Consolidated Mines Ltd, a company that is still synonymous with diamonds. Today South Africa is third in production in terms of value and is likely to remain so for the foreseeable future. 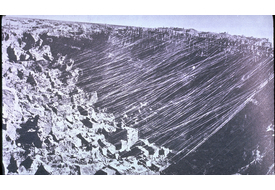 Citation: Copyright De Beers Consolidated Mines, PO Box 616, Kimberley, 8300 SOUTH AFRICA. All rights reserved. Text: American Museum of Natural History, 79 St & Central Park West, New York, NY 10024. Online at http://www.amnh.org/exhibitions/diamonds/africa.html. July 10, 2010. Card Text: 2-IMG00276 Kimberley diamond mines, c. 1880. As the diggings at Kimberley went deeper, each claimant set up his own pulley to extract the diamond-bearing ore. The capital of the Northern Cape Province, South Africa, Kimberley is historically important for its diamond-mining past and siege during the Second Boer War (1899-1902). Capitalists like Cecil Rhodes and the De Beers brothers made their fortunes here. Soon after whites discovered diamonds in South Africa in 1867, the diggings began to penetrate the surface. Chaos followed as individuals and small companies tried to work their claims independently. Gradually, mergers took place, and by the mid-1890s Cecil Rhodes and his associates dominated the mines. "South Side Staging, Kimberley Mine." Citation: Photo by Aldham & Aldham, Grahamstown, South Africa, c. 1880. Western Cape Archives, Private Bag X9025, Cape Town 8000, SOUTH AFRICA. And Yale University, Sterling Memorial Library, Manuscripts and Archives Collection, PO Box 208240, New Haven, CT 06520-8240. In "Reader's Digest Illustrated History of South Africa, The Real Story," (Copyright Reader's Digest, 480 Bedford Rd, Pleasantville, NY 10570-2929) 1988, p. 170. Reader's Digest Association of South Africa (Pty) Ltd. All rights reserved. Card Text: 2-IMG00012 Emperor Menelik of Ethiopia (1889-1913) and King of Shoa (1865-89) unified the Ethiopian highlands, conquered Harrar, and beat the Italians at Adowa in 1896. 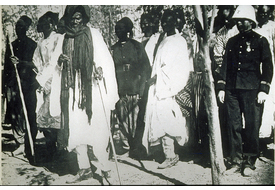 He negotiated with the French to prevent their expansion on the Somali coast. He managed brilliantly to keep Ethiopia independent at a time of overwhelming European expansion and imperialism in Africa. Citation: Photo by James William Young of Aden, 1911. In "Africa Aeterna: The Pictorial Chronicle of a Continent," text by Paul Marc Henry, trans. by Joel Carmichael, conceived and produced by Georges and Rosamond Bernier, (Lausanne, Switzerland: Sedo SA, 1965) p. 192. Card Text: 2-IMG00205 The racism of European imperialism in Africa: "The submission of King Prempeh: The final act of humiliation, 1896." In Jan. 1896 British authorities, referring to a debt incurred twenty years earlier, invaded Kumasi and surrounded the palace of the last king of the Ashanti Empire, the Asantehene Agyeman Prempeh. Victorious British troops clamored for him to come out of his palace and surrender. The gods had abandoned Prempeh and all hope was gone. Major Baden-Powell described the king's surrender: "When Prempeh emerged, the soldiers commanded the defeated king to grovel before them. It was a blow to the Ashanti pride and prestige such as they had never suffered before. Then came the demand for payment of the indemnity for the war [which the British themselves had caused].... The king could produce about a twentieth part of what had been promised. Accordingly, he was informed that he, together with his mother and chiefs, would now be held as prisoners and deported to the Gold Coast. King Prempeh was marched off to jail. Behind him, soldiers plundered his palace and burned down the sacred Burial-Place of the Kings of Ashanti. 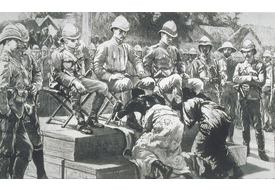 This drawing shows the submission of the Asante King Prempeh and the Queen Mother to British officers in 1896.... Virtually the entire continent was forced to submit to superior European force. Asante (Ashanti) had long been one of the most powerful states of West Africa, but after his submission, Prempeh was sent into exile and the British declared Asante a protectorate [colony]. However, the British demand that the Asante surrender their sacred Golden Stool several years later touched off an Asante rebellion in 1900, leading to British armed intervention and annexation by the British crown in 1901." Citation: The Graphic, (London, 1896). Roger Mansell Collection, Hoover Institution, 434 Galvez Mall, Stanford University, Stanford, CA 94305. Text: Maj. Robert S.S. Baden-Powell, "The Downfall of Prempeh, A Diary of Life with the Native Levy in Ashanti, 1895-6," (London: Methuen, 1896) Ch. 12. Online at www.pinetreeweb.com/bp-prempeh-12.htm. June 30, 2010. 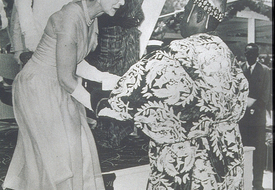 Card Text: 2-IMG00082 The English Duchess of Kent at Ghana's independence celebrations, 1957, West Africa. "First to go." 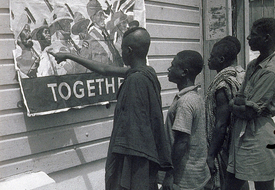 In May 1957 the Gold Coast became the independent nation of Ghana, and the first of many carefully stage-managed independence ceremonies was held. The transfer of power from Britain to each African nation took place at midnight with the Union Jack replaced by the new national flag, usually in front of a member of the British royal family. The Duchess of Kent represented Queen Elizabeth at Ghana's ceremony. Sir Charles Arden-Clarke, in pith helmet, was the British Governor of the Gold Coast colony, 1949-57. Citation: Copyright holder unknown. In Trevor Royle, "Winds of Change: The End of Empire in Africa," (John Murray Ltd, 50 Albemarle St, London W1X 4BD UNITED KINGDOM) 1996. 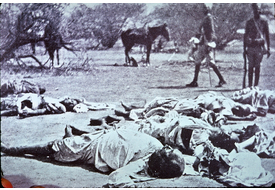 Card Text: 3-IMG00100 North African resistance to British colonialism, Sudan, 1899: After the Battle of Umm Debreika (Umm Diwaykarat), the body of the Khalifa lies in the foreground as colonial African soldiers with rifles look on. 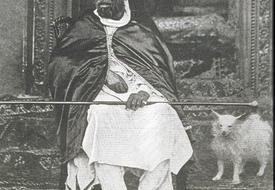 Abdallahi ibn Muhammad, known as the Khalifa (1846-99) was a Sudanese ruler and general. He commanded the last of the the Mahdist armies, who were defeated by an Anglo-Egyptian force under Col. Reginald Wingate in 1899 at the Battle of Umm Debreika. This loss ended the short-lived Sudanese empire of the Mahdi, Muhammad Ahmad. Although devout, intelligent, and an able general and administrator, the Khalifa was unable to overcome tribal dissension to unify the Sudan. Educated as a Muslim preacher and holy man, he became a follower of the Mahdi in 1880. He first fought at the Battle of El Obeid in 1883, where his troops destroyed Col. William Hicks's Anglo-Egyptian army, and he was the principal commander at the siege of Khartoum, 1884-85. At Umm Debreika the Khalifa died fighting on his prayer blanket. The Sudan remained under British control until its independence in 1956. Citation: Library of Congress Prints and Photographs Division, Washington, DC 20540. 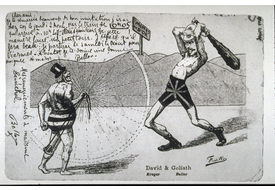 Card Text: 2-IMG00010 Anglo-Boer War cartoon: A small Paul Kruger, President of the South African Republic, as David about to be bludgeoned by British Gen. Redvers Buller as Goliath. It took over 400,000 British soldiers to defeat the 60,000 Boer fighters during the war in South Africa, 1899-1902. Gold mines in the background. French postcard printed during the war. Citation: R.B. Fleming & Co. photo. In "Africa Aeterna: The Pictorial Chronicle of a Continent," text by Paul Marc Henry, trans. by Joel Carmichael, conceived and produced by Georges and Rosamond Bernier (Lausanne, Switzerland: Sedo SA, 1965) p. 199. Card Text: 3-IMG00030 King Shaka, who built the powerful Zulu Empire in the 1820s, in a tense negotiation with British Lt. Francis Farewell in Natal, southern Africa, 1824. 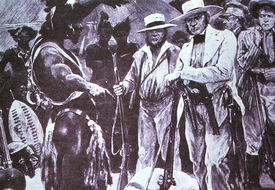 Shaka offers land to Farewell in return for his support in the Zulu civil war against the Ndwandwe. "The British Dominions Beyond the Seas - No. 1: The Birth of Natal Colony," Richard Caton Woodville painting, 1892. Citation: Illustrated London News, Dec. 6, 1902. In Robert W. July, "A History of the African People," 3rd ed. (Charles Scribner's Sons, Thomas Gale, 12 Lunar Dr, Woodbridge, CT 06525) 1980, fig. 21. Text: Mary Evans Picture Library Ltd, 59 Tranquil Vale, Blackheath, London SE3 0BS UNITED KINGDOM. Picture No. 10025953. Card Text: 2-IMG00024 European impressions of Africa, 1599: 1&2. Unknown animals 3. The King of Congo, converted to Christianity by the Portuguese, orders idols to be burnt 4. Ways of traveling: With no horses, and oxen too large to be harnessed, men bear the burdens 5. The King of Congo asks that missionaries be sent for his people, and the Portuguese immediately comply, adding ornaments, holy pictures and crucifixes 6. How the Guineans hunt and trap (from Vol. 6). 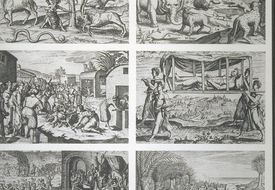 Citation: Theodor de Bry, "Petits Voyages," (Frankfurt, 1599) Vols. 2 & 6. Marc Lavrillier photo. In "Africa Aeterna: The Pictorial Chronicle of a Continent," text by Paul Marc Henry, trans. by Joel Carmichael, conceived and produced by Georges and Rosamond Bernier (Lausanne, Switzerland: Sedo SA, 1965) p. 95. 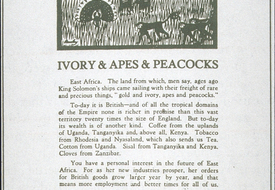 Card Text: 2-IMG00189 British ad promoting products and raw materials from British East Africa: Ivory & Apes & Peacocks. New markets for the "British race [sic]." The ad shows the relationship between African raw materials and new markets for European finished goods as causes for European imperialism in Africa. "The land from which, men say, ages ago King Solomon's ships came sailing with their freight of rare and precious things: 'gold and ivory, apes and peacocks.' Today it is British - and of all the tropical domains of the Empire none is richer in promise than this vast territory twenty times the size of England. But today its wealth is of another kind. Coffee from the uplands of Uganda, Tanganyika and, above all, Kenya. Tobacco from Rhodesia and Nyasaland, which also sends us tea. Cotton from Uganda. Sisal from Tanganyika and Kenya. Cloves from Zanzibar. You have a personal interest in the future of East Africa. For as her new industries prosper, her orders for British goods grow larger year by year, and that means more employment and better times for all of us. Drink Empire coffee - smoke Empire tobacco - use Empire binder twine. You'll be helping in one of the greatest colonising ventures to which the British race has ever set its hand. EAST AFRICA sends us COFFEE - TEA - COTTON - MAIZE - SISAL - HIDES AND SKINS - CLOVES - COPRA - OILSEEDS - GUMS - BINDER TWINE." Citation: Empire Marketing Board, The Times, London, 1926-27. © Copyright Times Newspapers Ltd 2011, 3 Thomas More Square, London E98 1XY UNITED KINGDOM. All rights reserved.